Long ago I turned down the chance of working in the pharmaceutical industry. I was then a graduate chemist and one of the reasons I had been attracted to chemistry was the potential for developing new drugs that would benefit humanity. But what I saw and heard when I went for an interview with one of the leading drug companies made me walk out of the door. Drug companies justify the high prices they charge for drugs by talking about their huge expenditure on research to develop new drugs and testing them, and the sums involved are indeed large. But still less than the amounts that they spend on marketing and trying to get their drugs prescribed – even in some cases if they are not particulary effective or appropriate. 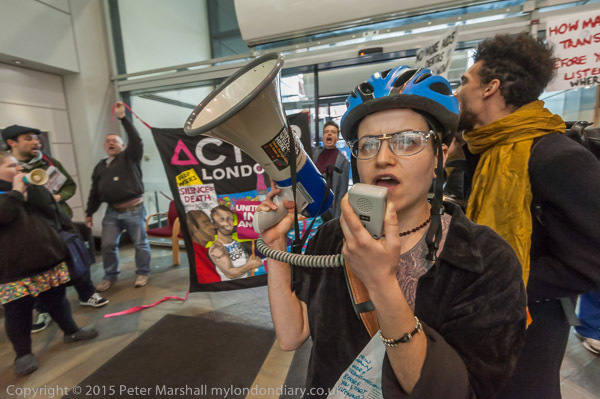 At the end of March and the start of April this year I photographed two protests by Act Up London involving medical drugs. The first was largely directed at NHS England who were refusing to accept that they should pay for PrEP, a pre-emptive treatment against AIDS, and trying to get local authorities to pick up the tab. They also announced a two-year pilot study into the use of the drug Truvada®, marketed by Gilead. Truvada contains two drugs, Emtricitabine which was discovered in 1996 at Emory University in Atlanta and Tenovir, first made at the Academy of Sciences of the Czech Republic and patented in 1984, though it needed research by Gilead and others to produce a derivative that was readily abosorbed – and this was approved for use in the USA in 2001. Gilead has had a long period to recoup the costs of their research, but they are still charging premium prices for both PrEP (Truvada) and for other drugs such as Harvoni, an effective treatment for Hepatis C. A month’s supply of Truvada costs the NHS £355, while a generic alternative – effectively the same – would cost a fiver. A 12 week course of Harvoni costs the NHS around £39,000, while there are various ways to obtain a generic alternative (made in Bangladesh, India or Australia) for less than £2,500 for the same course – around a sixteenth of the cost. 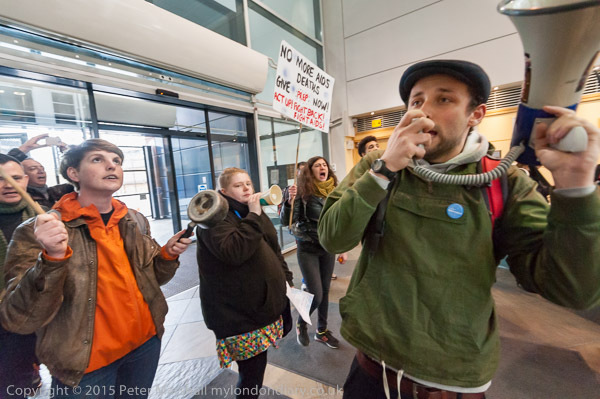 The protest at NHS England – next to the Bakerloo line Elephant & Castle terminus – was pretty conventional, with a short rally outside after which protesters rushed in past security and made a noisy protest inside until police arrived and they left to continue their rally outside. At Gilead’s offices on High Holborn it was a different story, with the protest being kept secret and preparations being made a short distance away before walking to the location, where a group of five protesters walked inside and stood in the window, dropping the gowns they had worn on the way there to stand naked with large painted letters G R E E D on their backs. Photographically it was rather tricky, as the glass reflected too much light. I hadn’t known in advance what form the protest would take. I don’t think a polarising filter which is often used to cut reflections would have helped as it really needed to be photographed ‘head on’ when they make no difference. Although I don’t usually direct people I’m photographing I did go inside the office and ask the five to move right back as close as they could to the glass, which did make them a little more visible, but the image owes rather a lot to Lightroom and work on the bodies to bring them out. The full image that the protesters wanted – the five naked bodies spelling out ‘GREED’ with the two banners, one each side reading ‘#PHARMA’ and ‘KILLS’ presented another insurmountable problem, that of aspect ratio. As you can see there were large areas of fairly empty space both above and below that line reading #Pharma Greed Kills. It would have made a picture with an aspect ratio of 4 or 5:1 rather than the 1.5:1 I was using. This entry was posted on Wednesday, December 21st, 2016 at 09:23 am and is filed under My Own Work, Photo Issues, Political Issues. You can follow any responses to this entry through the RSS 2.0 feed. You can leave a response, or trackback from your own site.